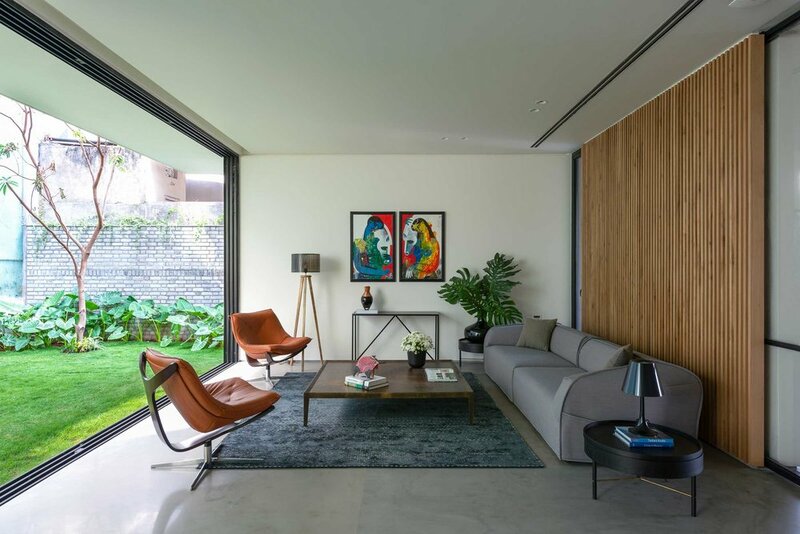 In the leafy neighbourhood of Jubilee Hills in West Hyderabad, multi-disciplinary architecture and interior design practice EL+D have designed a family home that resembles a stack of stylish cubes, introducing an intriguing form to the existing streetscape. Throughout the house, visible elements can become hidden when necessary. Moving walls divide public spaces, and when not in use can be concealed within a pocket. The staircase railing is concealed in the wall and is enhanced by extra lighting details, while the concrete ceiling in the second-floor lounge extends outdoors. Protruding levels and terraces form recesses in the facade, adding to the distinctive block-like appearance. Structurally, the blocks are stacked and then split across, creating courtyards and slits that form skylights within. ‘There was a lot of emphasis on bringing the outdoors into the living spaces,’ Modi shares, and the abundance of natural light reflects this aim. Every corner of the home is bathed in diffused daylight thanks to striking vertical slits and a north-facing skylight in the central zone. Even the parking space is light-filled due to a screen comprising 1200 custom-size bricks. Boundaries between indoors and outdoors are further blurred with large terraces on multiple levels, courtyards open to the sky and all the public spaces opening outwards. The designers used a materials palette full of raw textures. Exposed concrete, raw brick walls, local stonework, hot rolled steel and timber slats feature throughout the house. The powder room was even built using leftover construction stone, and various shades and textures of local stones fashion a dramatic focal point. The muted palette is punctuated with eclectic furniture pieces and stunning artworks selected from the owner’s personal art collections. In the dining room, a bold piece by artist Pratul Dash hangs behind a Mirto dining table from B&B Italia by Antonio Citterio. Chairs from Bonaldo and a Dear Ingo Moooi light complete this stylish room. In the living room, the Moroso M.A.S.S.A.S sofa by Patricia Urquiola is paired with Roche Bobois by Cédric Ragot Dolphin armchairs and a large burnished brass coffee table from Henge. The Stack House masterfully blurs spatial boundaries and embraces natural light to create an innovative family home that is anything but boxy.